Transparency Market Research has released a new market report titled “Gas Insulated Substation Market - Global Industry Analysis, Size, Share, Growth Trends, and Forecast 2016 - 2024”. According to this report, the gas insulated substation market revenue stood at US$ 14.75 Bn in 2015 and is projected to reach US$ 35.83 Bn by 2024 at a CAGR of 10.31% from 2016 to 2024. Increasing need for compact and low maintenance power systems led to the emergence of gas insulated substations. These substations were developed in Japan since the country is located in a high seismic zone and there was a need for substations, which could be installed in small confined spaces. Gas insulated substations are much more reliable and more efficient than their counterparts air insulated substations. These high voltage substations can be installed in a small sealed environment with sulfur hexafluoride gas acting as the insulating medium. Demand for increased power generation in urban areas has led many countries to adopt high voltage substations. Gas insulated substations work reliably at high voltages and require less operation and maintenance services. Air insulated substations are susceptible to rising pollution levels, thus such substations can effectively be substituted with gas insulated substations for continuous operations. The market for these substations is anticipated to rise at a substantial pace in the near future due to increasing environmental concerns and scarcity of land in urban areas. Increasing cost of land and demand for compact power systems are the primary drivers boosting the market for gas insulated substations. In urban areas, where availability of land is a rising concern, gas insulated substations can be installed in small areas within a building. The total space required by a gas insulated substation is approximately 10% of that required by a conventional substation. In harsh environmental areas, such as deserts and arctic regions, these substations provide reliable operating performance. 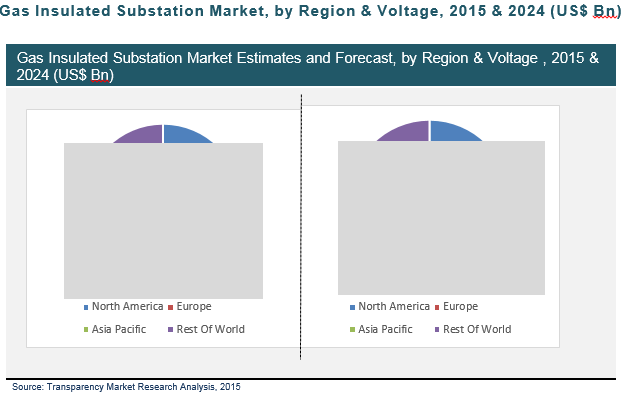 The gas insulated substation market has been segmented, by region into Asia Pacific, North America, Europe, and Rest of World. The gas insulated substation market is further segment by voltage into medium (≤ 72.5 KV) and high (>72.5 KV). High voltage gas insulated substations are primarily used for transmission and distribution of electricity at high and extra-high voltage. Asia Pacific was the largest market for gas insulated substations globally, accounting for 54% of the market in 2015. China was the leader in terms of revenue realization from gas insulated substations, followed by India, in 2015. Europe was the second-largest market for gas insulated substations in 2015. CIS countries, such as Russia, spearhead the gas insulated substation market in Europe with modification and expansion of aged electricity infrastructure. North America was the third-largest market for gas insulated substations, in terms of market share, in 2015. The U.S. and Canada were the leading countries with highest revenue realization from gas insulated substations in 2015. The market in Rest of World is expected to witness significant growth in the near future, with growth in the manufacturing and processing sectors and increasing demand for electricity. The market in Gulf Cooperation Council (GCC) countries is expected to expand at the highest CAGR during the forecast period. Industrialization, and growth in manufacturing and power generation would drive the demand for gas insulated substations in GCC countries. Some of the key manufacturers of gas insulated substations are ABB Group, Eaton Corporation Plc., Fuji Electric Co., Ltd., General Electric Company, Hitachi, Ltd., Mitsubishi Electric Corporation, Schneider Electric SE, Siemens AG, Crompton Greaves Limited, and Toshiba Corporation.